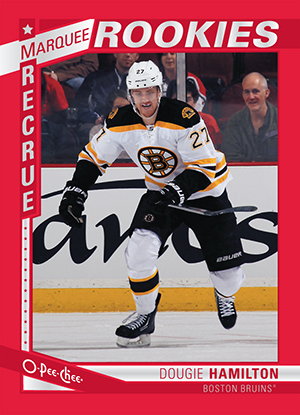 Back for a second season, the 2013-14 O-Pee-Chee Hockey wrapper redemption offers collectors exclusive parallels and an all-new set of inserts. Like last year, the program is open only to Canadian collectors. Those who take 50 hobby wrappers to a participating shop will receive a pack of six cards, five exclusive Red Border parallels and one Stamps insert. Only Upper Deck Diamond Certified Dealers are able to offer the wrapper redemption. When a bundle of wrappers is submitted, the shop owner takes down the collector's contact info. The dealer then sends the wrappers to Upper Deck. After the redemption is confirmed and the packs are sent to the dealer, the collector is informed they've got a package waiting for them to pick up the next time they visit the shop. Wrapper redemption packs are available while supplies last. The Red parallels cover the entire 600-card 2013-14 O-Pee-Chee Hockey set. 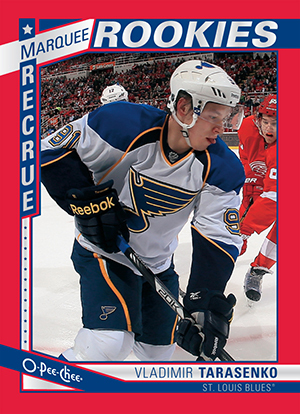 Nail Yakupov, Jonathan Huberdeau, Vladimir Tarasenko and Alex Galchenyuk are among the 100 rookies on the checklist. 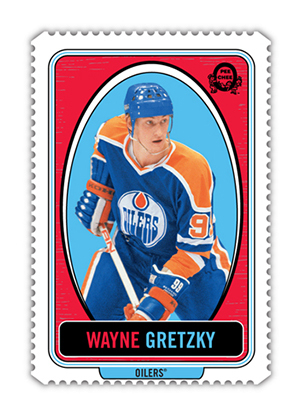 The retro-feeling Stamps set has 50 cards. 2013-14 O-Pee-Chee Hockey is scheduled for release this August.